Most of the time spent in the kitchen goes in cooking meals. There are a number of ways to ensure that cooking in the kitchen is carried out in a more energy efficient manner. The first step in cooking efficiently is to match the right method of cooking with the dish to be prepared. Cooking methods that minimize the area to be heated helps in reducing the amount of heat required. For example, using a toaster is considered more efficient than toasting a slice of bread in an oven. The fine balance is selecting a method that is energy efficient and does not compromise on the quality of food being delivered. A microwave for example may be highly efficient but is considered at times to compromise on the quality of food that is being prepared. Selecting the right pan size for a dish and matching it accurately with the size of the cook top is also crucial in ensuring that there is no waste of energy. 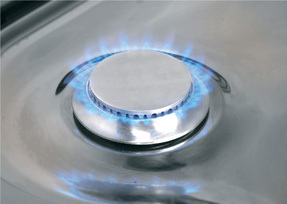 Using a small sized pan on an over-sized burner can lead to as much as a 40% loss of energy. The pan shape and the mode of cooking also need to be taken into consideration. A slightly concave pan is ideal for a gas stove top while a flat bottom pan that increases the contact area is essential for an electric stove top. Using cookware made of high conductivity materials will ensure that less time is taken to heat the pan and therefore proves to be more energy efficient in the process. Utensils made up of high conductivity materials ensure that food is cooked more evenly. Conductivity depends upon the mode of cooking. On a regular stove, copper pans conduct heat more efficiently than those made of other materials. Glass and ceramic pans heat faster in ovens than metal ones. In fact, you can reduce heat requirements by 25°F. Keeping the burner clean is crucial to ensure that it works efficiently and effectively. A blackened burner, which has lot of burnt food on it, can absorb heat reducing burner efficiency in the process. When the burner is shiny, it is able to reflect heat onto the pans more easily. Energy efficient cooking requires considerable preplanning. Frozen foods should be defrosted by moving the food article from the freezer to the main fresh food compartment. Try to reduce the amount of pre-heat time in conventional ovens. The self cleaning option available in some ovens should be used sparingly and only after a meal has been cooked so that the residual heat can be utilized.